This article first appeared in the Rushville Republican on Tuesday, February 21, 2017. 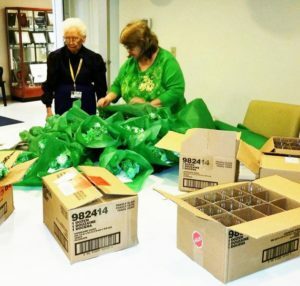 Many Rush Memorial Hospital volunteers are members of RSVP (Retired & Senior Volunteer Program). The RSVP program began in the 1970’s with the purpose of providing “a variety of opportunities for retired persons aged 60 and older to participate more fully in the life of the community through significant volunteer service” according to the RSVP information brochure. In 1993 RSVP, along with the Foster Grandparent program, became a part of the Corporation for National and Community Service. The eligibility age was lowered to 55 years old. Today there are more than 450,000 RSVP volunteers nationwide. Locally, the RSVP organization is partnered with the ICAP (Interlocal Community Action Program, Inc.) office located in New Castle. The RSVP organization that covers Rush County volunteers includes Henry and Hancock county volunteers as well. The mission statement for the local RSVP states, “The Retired and Senior Volunteer Program of Hancock, Henry and Rush counties is committed to using the talents of people 55 years and older to help meet our community’s needs”. Marla Ritchie, RSVP Coordinator, can be contacted at 765-529-4403 or online at mritchie@icapcaa.org for additional information about the organization. Marla and the RSVP Advisory Council have recently announced the upcoming annual green carnation sale. This year the beautiful green carnations will be provided by Rushville Florist. The carnations can be purchased individually for $1.00 each or in a glass vase including 5 carnations plus greenery for $10.00 per bouquet. All proceeds go to funding the RSVP program which celebrates and honors volunteerism and provides additional benefits for those volunteering in Rush, Henry, and Hancock counties. RMH volunteer and RSVP member Ramona Wilkinson will be making contacts with local businesses and individuals that have supported the sale in the past. Also, Faith Mock, RMH Foundation Director and RMH Volunteer Coordinator, will be contacting past supporters. The carnations will be delivered on Wednesday, March 15 just in time for St. Patrick’s Day. If you are interested in ordering carnations, contact Faith Mock at 765-932-7568 or Ramona Wilkinson at 765-932-5635 by the March 8 order deadline.